Wife and philosopher says it's "unconscionable" not to have a choice. Leah Hogsten | The Salt Lake Tribune Retired University of Utah English professor Brooke Hopkins, paralyzed from the neck down in a November 2008 bicycling accident, talks about his decision to move home a year ago at the U. of U. 's 2012 Disability Studies Forum. Leah Hogsten | The Salt Lake Tribune University of Utah philosophy professor Margaret (Peggy) Battin listens as her husband, retired English professor Brooke Hopkins, shares his views on continuing his convalesence at home a year ago, two years after a spinal cord injury from a bicycle accident left him paralyzed from the neck down. 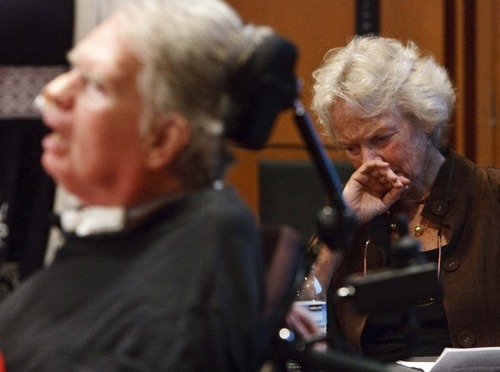 Leah Hogsten | The Salt Lake Tribune University of Utah philosophy professor Margaret (Peggy) Battin reacts to some of the touching comments made by her paralyzed husband, retired English professor Brooke Hopkins, as he addressed a U. of U. Disability Studies Forum on Friday about his preference to live at home. Home is where retired University of Utah English professor Brooke Hopkins is, and wants to be, as he carries on with life 3½ years after a paralyzing bicycle accident. 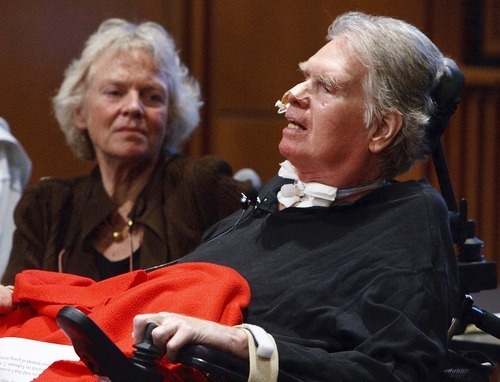 But Hopkins and his caretaker wife, U. philosophy professor Peggy Battin, said Friday they know his ability to live outside of an institution is possible largely because they had financial access to care resources unavailable to most people with disabilities. And to an ethicist such as Battin, it is "unconscionable" that social policies driven by insurance coverage and health care reform proposals prohibit some people from choosing where they reside while coming to terms with their circumstances. "The bottom line," she said, "is we ought to make it possible for it to be your choice" to live at home or in an institutional care facility. Hopkins and Battin were keynote speakers at the 2012 Disability Studies Forum, whose topic was "There's No Place Like Home." Other sessions dealt with the home-care issue from the perspectives of others with disabilities  a deaf and blind woman, a schizophrenic formerly addicted to drugs, a traumatic brain injury victim and the parent of grown children with autism  as well as service providers. 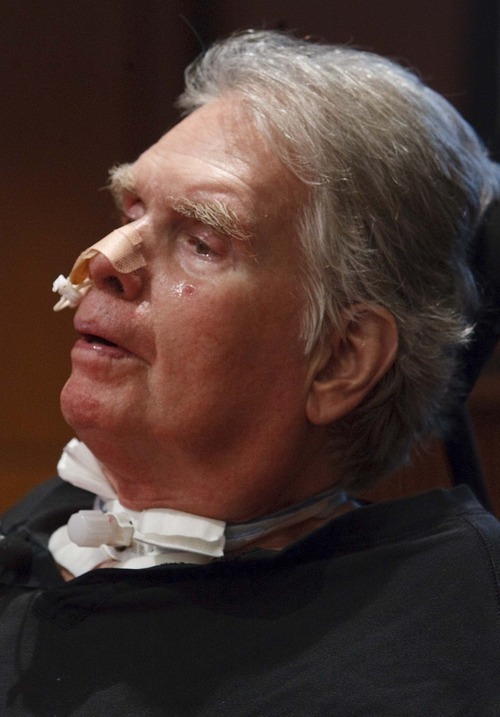 Speaking from a wheelchair, flanked by his wife and one of the nearly dozen home health care workers hired to tend to his needs around the clock, Hopkins said that returning to his Avenues home after two years in medical institutions was more difficult than he expected. He worried whether home-care arrangements would work. Would he be safe? Psychologically, too, it was hard to see so many things around the house that reminded him of what he could do before his spinal cord was severed in a bicycle collision in City Creek Canyon in November 2008. Nevertheless, Hopkins said, "whatever pain is associated with living in this chained condition [with] reminders of the past, my feelings of belonging outweigh all of that." "I belong there," he added. Battin said the decision to move her husband home was frightening for her and other family members as well. But in weighing the benefits and disadvantages of home care, and of institutional care, she said it became clear Hopkins and the family would be better off with him living under his own roof. "That way you can live with the person and not just visit them," she said, lauding the extra spontaneity and flexibility available at home. "Just think about what you can do at home that is not permitted or is frowned upon somewhere else." The couple's systematic evaluation of their available options impressed Andrew Riggle, who has spent most of his life in a wheelchair because of cerebral palsy but has his own apartment. But he was struck by Battin's observation that victims of devastating spinal cord or brain injuries often are young men with little or no resources or health insurance  people who usually end up tucked away in care facilities. "I'm really happy that folks like Brooke and Peggy have the time, resources and ability to be able to make the choices they do and are able to make it work," said Riggle, a public policy advocate for the Disability Law Center. "I just wish everybody could be treated that way," he added. "We need to find a way to make their experience the norm, not the exception."